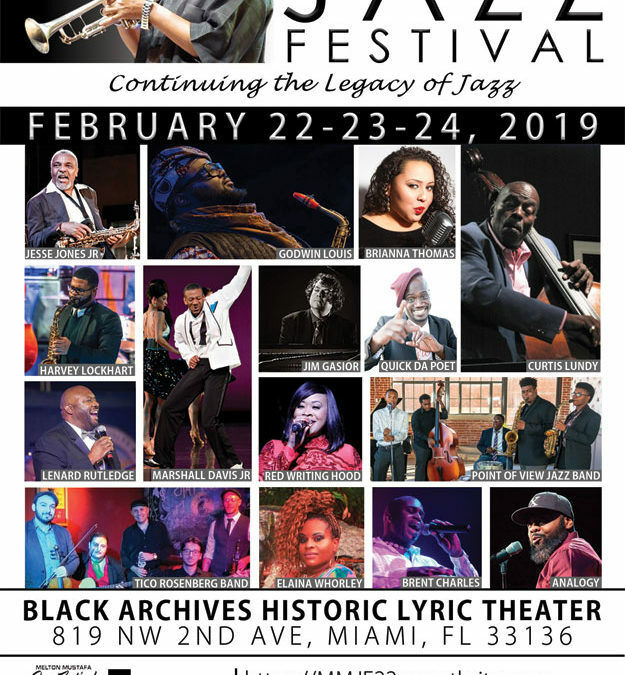 THE 22ND ANNUAL MELTON MUSTAFA JAZZ FEST FEBRUARY 22-24 @BLACK ARCHIVES HISTORIC THEATER IN MIAMI. Live Jazz and Spoken Word Hosted by Quick Da Poet featuring The Brent Charles Band, Elaina Worley, Analogy, Red Writing Hood. 6:00PM: Melton Mustafa Jazz Festival Concert featuring Virtuoso Bassist Curtis Lundy, The Incredible Vocalist Brianna Thomas, International Saxophonist Godwin Louis, The acclaimed Tap Dancer Marshall Davis Jr., The Legendary Melton Mustafa Orchestra, The Point of View Jazz Band directed by Harvey Lockhart and Mr. Bebop Saxophonist Jesse Jones Jr.